Twelve years of rule by Hitler and the Nazi Party could have made Germany a third world country after the end of the war, and according to some highly placed Allied officials of the time; that would not have been such a bad idea. Whatever treatment the Allies had in mind for the Germans could not have been much worse than the conditions already in existence for them just before and just after the end of the war. The German economy and infrastructure was already a wreck and the inflation continued after the surrender with prices of essentials (if they could be bought) rising to double and triple that of 1943. Only the war industry continued to function reasonably well right up to the end. He has never voted for any political party and does not support one now, saying that the only honest politician he remembers is Adolf Hitler. “Hitler said, ‘Give me five years and you won’t recognize Germany’. This book is a memoir of Wilhelm Gehlen and his childhood in Nazi Germany, as a Nazi Youth and the awful circumstances which he and his friends and family had to endure during and following the war. 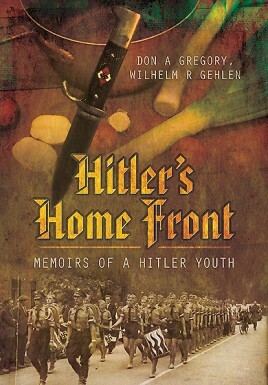 Including a handful of recipes and descriptions of the strange and sometimes disgusting food that nevertheless kept people alive, this book sheds light on the truly awful conditions and the common feeling and aim among members of the Hitler Youth – that it was their duty to do everything possible to save the Thousand Year Reich in 1945. Don Allen Gregory has been Professor of Physics at the University of Alabama in Huntsville since 1993. Before teaching, Don was supervisory research physicist for the US Army Missile Command, and a Materials Scientist for NASA/ Marshall Space Flight Centre. He is the author of more than 130 technical publications as well as having written articles for World War II History, Military History, and World War II Magazine. Wilhelm Reinhard Gehlen was born in Germany’s Rhineland in 1933, the year Adolf Hitler became German Chancellor, where he joined the Hitler Youth and attended one of Adolf Hitler's Volk Schools. Will has since served in Indochina (Annam-Tonkin) and North Africa with the Foreign Legion and worked for the International War Grave Commission of NATO. "These are the memoirs of Wilhelm Reinhard Gehlen, a member of the Hitler Youth, a helper on a 20mm quad flak gun, and a part-time gardener during his childhood in Nazi Germany. In 1942, at the tender age of nine, Gregory took the 'Jungvolk' oath and along with other boys of a similar age vowed to give his life for Hitler. This candid and revealing memoir shows a normal boy and a family at war and in its aftermath, determined to do what it took to survive. Fascinating memoir 10/10"